Usually, I gift a bottle of wine when I attend parties at this time of the year, but I came across an interesting book called It’s a Wrap by Susan Breier. Hmmm, what about a fabric bowl? I have fabric. Boy do I have fabric. I even had the correct type of clothesline in the house. All right, I was in the basket making business. 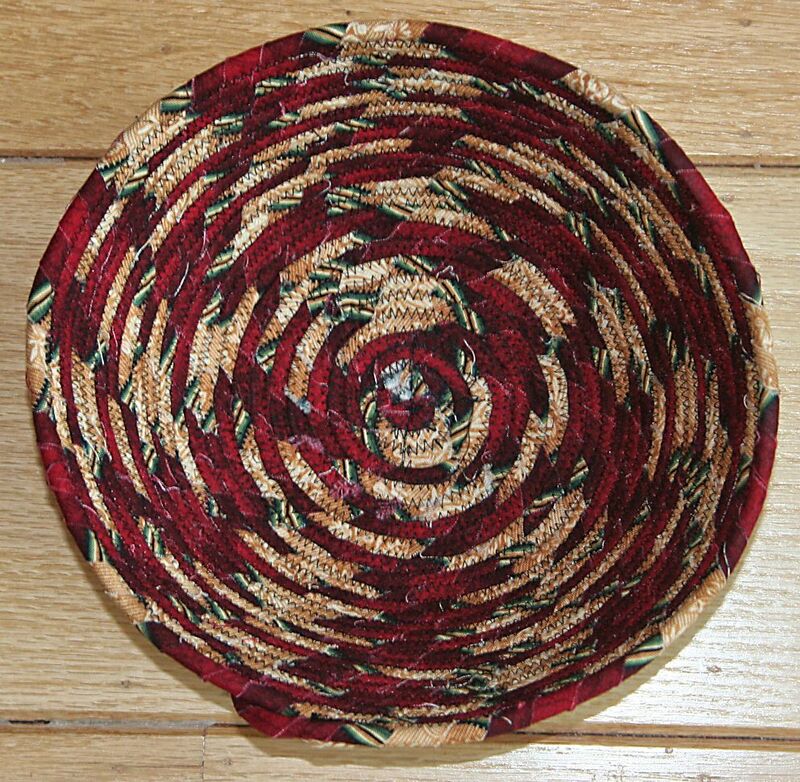 It is so much fun making one of these baskets. Yes, it’s a little tedious wrapping the fabric strips around the clothesline, but when you get to the sewing, before you know it, a basket is constructed before your eyes. Fill it up with macaroons and scones, and you have a wonderful hostess gift. Do yourself a favor and pick up a copy of this book. Before you know it, you’ll be making bowls, and purses, and plates galore. My most recent piece was for the international art quilt blog I belong to Sky is the Limit and I thoroughly enjoyed the entire process. This piece started out as a white piece of fabric. I selected an image, and traced it with a fine Sharpie black marker. Then it sat on my kitchen table for a month. What can I say? I’m wonderful at procrastination. The deadline passed, I was going to have company soon, and needed the kitchen table, so I got busy last week. First thing was to stamp those swirls all over the fabric. I used Golden Bronze mixed with a lot of textile medium, but it came way too dark. Solution? I took it to the kitchen sink, and scrubbed it with soap and water. Now I was happier with the much lighter swirls. Next came painting the image. I love, love, love using textile and alcohol inks with clear aloe gel, so did exactly that. Still worried that one side had darker swirls than the other, I decided to paint both sides of the piece. Thus came the disastrous bleeding outside the lines in the apple tree leaves. I did not wait for one side to dry before I flipped it over and painted the other side. Lesson learned – let the paint dry before you attempt to paint both sides of the fabric. It’s really not that big a deal, and I kept it “as is” to remind me not to do that again – unless I want a watercolor effect. Next step was layer it up with batting, and using 6 strands of DMC floss I sewed big stitches around the image – just like I did when I was 3 years old. I added the numbers as I sewed the big stitches with an Ultra Fine Sharpie marker. 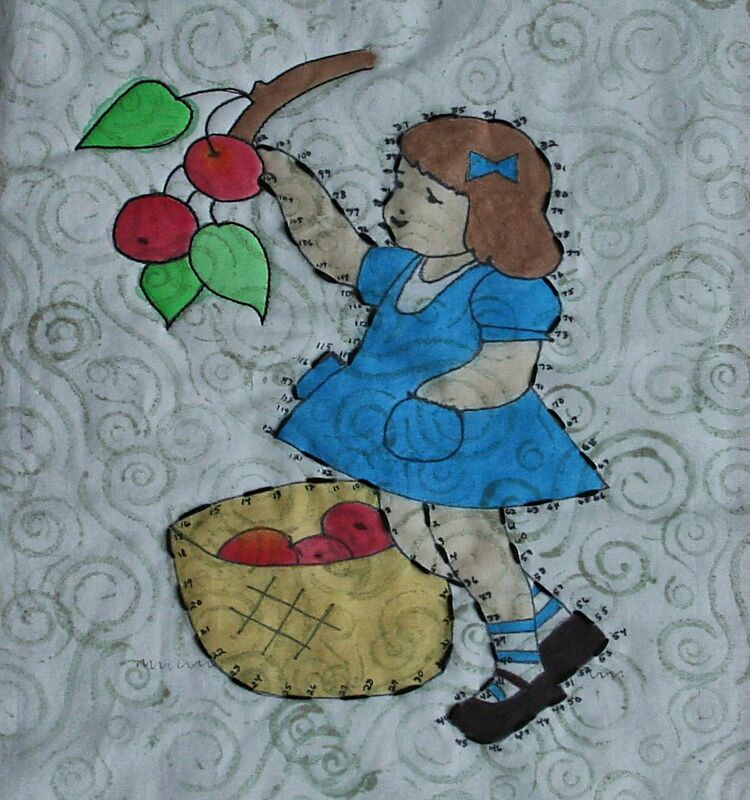 Then I added backing fabric, and machine quilted around the apple tree branch and apples. Heat set the piece with my iron, then used my favorite binding technique, and ta da Child’s Play was completed. This was so much fun to make. Every time I approached this piece, I felt like it was play time. With all the misery in the world, I needed to create a bit of calm and happiness for myself, and wish the entire world could be at peace. That is my fervent desire for all of you.